Just Nan Gingerbread Jingle Mouse Limited edition ornament code JNLEGJM - he has arrived back just in time for valentines day ! Cross stitch chart and embellishment pack including the tail ! . You will need to provide your own fabricand threads . .
Cross stitch chart and embellishment pack to make this cute stocking to hide your mouse in or to fill with tiny sweets . You will need to provide your own fabricand threads . . Contains embellishment pack. You will need to provide your own materials. This cutest christmas mouse measures up 2 by 3 and half inches design area on 32 count fabric (not included). Includes all instructions tail and antlers ! Just need threads, tiny bit toy filling and small piece of linen . These mice are great to stitch - enjoy! Try doing the matching stocking as well. Cross stitch chart and embellishment pack to make this adorable stocking to hide your mouse in or to fill with tiny sweets. This measures 2.25 x 2.5 inches when finished. You will need to provide your own fabric and threads . . This gorgeous little cube measures 1 and three quarter inches on each face. It was stitched on 32 count Zweigart Belfast linen - design area of 6 1/2 x 5"
You will also need threads, stuffing and a bit of light weight fusible interlining . Sparkle flake pin is not included. This gorgeous little cube measures 1 1/2 inches on each face. This gorgeous little owl was worked on 32count pearl grey Belfast linen. The design area was 2 3/4" x 4 3/4" . Included in the pack are chart and instructions, beads, fire crystal, snowflake sequins, white felt, white yarn and the silver crown. You will need fabric, threads, stuffing and a bit of light weight fusible interlining . 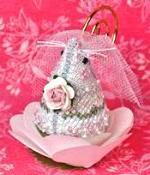 This gorgeous little ornament measures 2 1/2 inches x 2 1/2" . It has an amazing hand painted dragonfly charm. You will need fabric, threads, and stuffing. Just Nan Cloverly's Bunny Bungalow Cross Stitch Chart and embellishments . limited edition 2018 . Unbelievably got a bit more stock!! Just Nan Witchy's Sister Mouse -spooky for halloween ! This cutest mouse measures up 2 by 3 and half inches design area on 32 count . .includes all instructions , tail,beads,felt,broom,hat and pin ! just need threads ,tiny bit toy filling and small piece of linen . These mice are great to stitch - enjoy! there are two more halloween mice - witchy hersef and hazel fun witch ..
Just Nan Hazel Fun Witch Mouse -spooky for halloween ! there are two more halloween mice - witchy hersef and her witchy sister ! ..
Just Nan Witchy Mouse -the original spooky mouse for halloween ! there are two more halloween mice - miss witchy 's sister and hazel fun witch ..
Charming tiny bird ornament, 3.5 x 2" design size. Contains heart, flower and beads embellishments. You will need to provide your own materials and threads. Charming tiny hedgehog ornament, 4.5"x 6.5" on 28ct linen. You will need to provide your own materials and threads. This gorgeous little design measures 3 1/2 inches x 5" when worked on 28 count fabric. The example is on Zweigart Blue Whisper Cashel linen . The pack contains chart , instructions and beads. You will need fabric and threads. Also included is a chart and instructions for Garden Colours Motif - a 2" x 2" design exploring different stitches. This gorgeous little cross stitch measures 2 1/2 x 2 1/2" . The example was worked on 30 count blue linen. The pack includes chart and instructions, and beads. You will need fabric and threads. Nine rabbits doing what they do best - hopping!! together with lovely pastel flower embellishments and beads . design size 6x4 inch on 32 count needlework fabric . You will need to provide your own threads and fabric . Contains bee embellishment. You will need to provide your own materials. Contains embellishment pack of beads and silver coloured shell. Design area is 11.25"x 4.25" on 28ct linen.. You will need to provide your own materials and threads. Charming contemporary design of patterned hearts and birds shaped into a simple tree. Contains bead and heart embellishment pack. 4.75"x 3.5" on 32ct linen. You will need to provide your own materials. Design size is 9"x 9" on 32ct linen. Contains bead embellishment pack. You will need to provide your own materials and threads. Design size is 11.5"x 5.5" on 34ct linen. Contains beads, charm embellishment and lace pack. You will need to provide your own materials and threads. Contains bead pack. You will need to provide your own materials. White and pink design measuring 6¾" X 6¾" (18cm X 18cm). Contains embellishment pack. You will need to provide your own materials. Lovely birth sampler measuring 9.75"x 4.5" on 32 count linen(11¼" X 5" on 28ct linen). Contains embellishment pack of a swan bead, instructions, chart and threads list. You will need to provide your own threads, material and needle..
Lovely birth sampler measuring 10¼" X 5" (26cm X 12.7cm). Contains embellishment pack, instructions, chart and threads list. You will need to provide your own threads, material and needle..
design size for the sampler is 13 x 9.5 inches on 28 count needlework fabric . the words are meant to give a hint of summer to this beautiful sampler . the matching needlecase is 6.75x 2.75 inches . a really sumptuous piece of needlework to stitch . A real great start to the day to read the prose on this sampler . great depth to this house with its formal garden . includes silk, charm and beads . design size 13.5 x 9.25 inches on 28 count evenweave linen . A gorgeous wintery sampler ideal for the long cold days and evenings when we cannot get out in the garden and so can stitch . 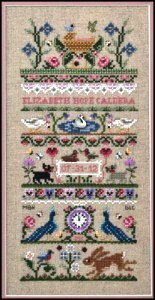 peaceful prose and great design size for sampler is 13 x 8.75 inches on 28 count evenweave linen . there is a chart for a scissor keeper too . Clever tiny design giving finished decoration size of 5.5 and 2.25 inches. Contains embellishment pack with beads , crystals ,candy cane ribbon . You will need to provide your own threads and fabric . scrumptious father christmas in rich scarlet coat laden down with toys as gifts plus a tiny tree in the cutest frame - one inch square !. Contains embellishment pack with beads , crystals ,candy cane ribbon . You will need to provide your own threads and fabric . father christmas is 6.75x 3.5 inches on 14 or 28 count fabric . Christmas sampler measuring 11¾X 5" (30cm X 13cm). Contains embellishment pack. You will need to provide your own materials. Elegant and intricate Winter design. Contains embellishment pack with beads and metal centre piece . You will need to provide your own threads and fabric . Design area is 7.5"x 7.5" inches on 32 or 28 count fabric . Elegant and intricate Christmas sampler design. Accessory Pack contains embellishments and gingham 28ct linen . You will need to provide your own threads . Design area is 9.75"x 15.5" . Festive design measuring 7½" X 3¼" (20cm X 9cm). Contains embellishment pack. You will need to provide your own materials. Cross stitch birth sampler measuring 15¼" X 4¾" (38.8cm X 12.1cm). Contains embellishment pack. You will need to provide your own materials. Cross stitch design/project measuring 4 3/4" X 4 3/4" on 32ct linen. Can be made into a picture or a needlecase. Contains embellishment pack. You will need to provide your own materials and threads. Cross stitch project measuring 4¾" X 4¾" (12.1cm X 12.1cm). Can be made into a picture or a needlecase. Contains embellishment pack. You will need to provide your own materials. Cross stitch design/project measuring 5" X 5" on 32ct linen. Can be made into a picture or a needlecase. Contains embellishment pack. You will need to provide your own materials and threads. 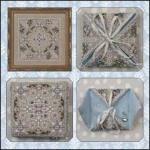 Beautiful Winter themed cross stitch project measuring 5" X 5" if using 32count linen. Can be made into a picture or a needlecase. Contains embellishment pack. You will need to provide your own materials and threads. Cross stitch project measuring 4¼" X 4¼" (12cm X 12cm). Contains embellishment pack. You will need to provide your own materials. This gorgeous little owl cross stitch measures 5 inches x 3 1/4 inches when worked on 32 count fabric. It is shown on 32 ct Flax Belfast linen from Zweigart. The pack includes chart and instructions . You will need threads and fabric. A wise old owl sat on an oak. Percy is the one on the right. 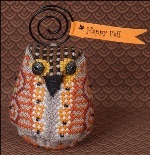 This little hoot is both cute and versatile, use as a needle case or snap onto a branch as a quirky decoration. Comes with chart, instructions, beads, popper, ribbon for ears and tail, felt for the lining and paper template. The example was stitched on 30count purple linen - design area was 3" x 1 3/4"
Ollie is the one on the left. The example was stitched on 30count orange linen - design area was 3" x 1 3/4"
This cutest mouse measures up 2 by 3 and half inches design area on 32 count . .includes all instructions tail,,beads,felt,and pin ! just need threads ,tiny bit toy filling and small piece of linen . These mice are great to stitch - enjoy!